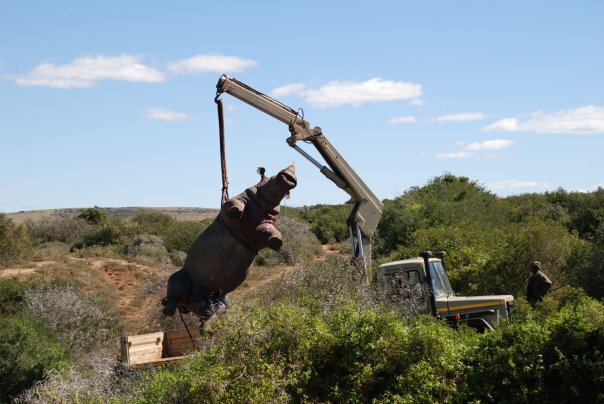 It is with great sadness this week that I have been reading article such as this one; stating that at least 51 rhinos have been killed this year for their horns. I have come across many articles about rhinos lately, and it’s no surprise to me that they are often in the spotlight given the fact that they have such a history of being poached and hunted. Whenever I hear another sad story about how these huge, powerful creatures are the subject of human attack I find it nearly impossible to comprehend. 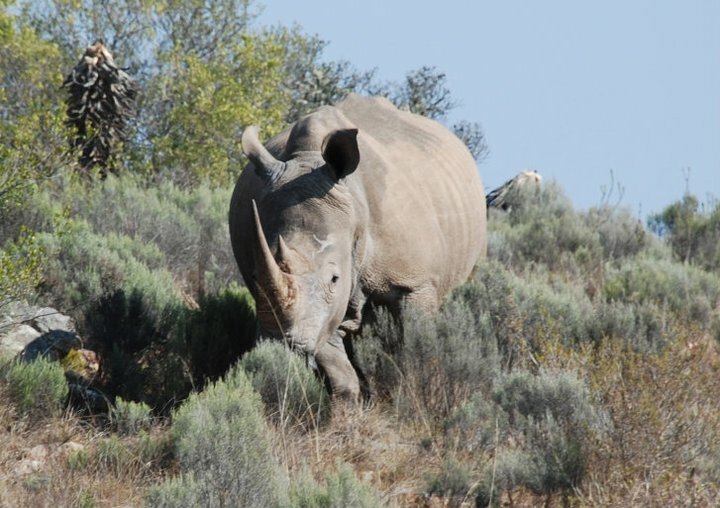 Several times at Shamwari I had close encounters with rhinos. 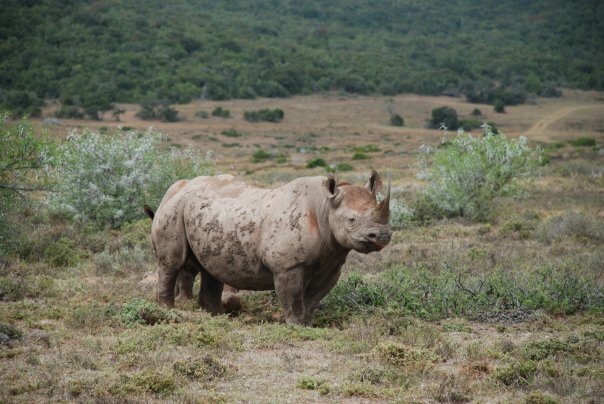 There are both types of African rhino present at Shamwari Game Reserve; the more common white rhino, and the rare black rhino. 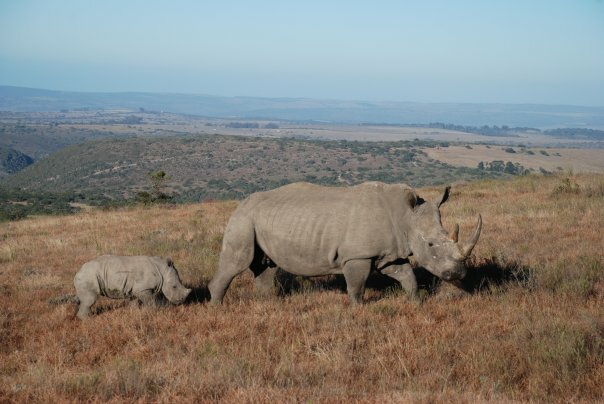 During my 3-month stay I only saw black rhinos twice. The two can be distinguished from one another by their size (white rhino is larger) and the shape of their nose (black rhinos have a more pointed shape; where as white rhinos have a more square nose). Black rhinos seemed to be the more timid of the two from my experience; the times that I encountered them they simply ran away from our vehicle when we got too close. White rhinos on the other hand were a much scarier kettle of fish! Not only was our vehicle chased in the day, but twice I was in a group than got followed by several of these powerful creatures whilst on a bush walk (just a group of us on foot, with nothing between ourselves and the animal). There was also one specific night drive where a particularly grumpy white rhino tried to charge into the side of the vehicle that I sitting on! Even as we sped up to drive away it kept pace for a good few minutes. It’s not an exaggeration to say my heart leapt into my throat and stayed there until we’d finally broke away from this grumpy male. 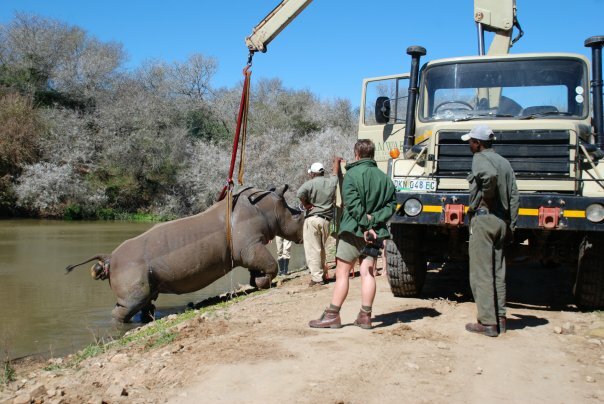 One other rhino incident at Shamwari that is difficult to forget is the day we had went to watch the Shamwari vet and his team remove two males from the Bushman’s River after they’d toppled off a cliff during a fight and drowned. This was a sombre day (to lose two perfectly healthy males through their own clumsiness) but this was a great opportunity for education (we got to perform an autopsy ) and a reminder of just how delicate life is (even in the biggest of creatures). 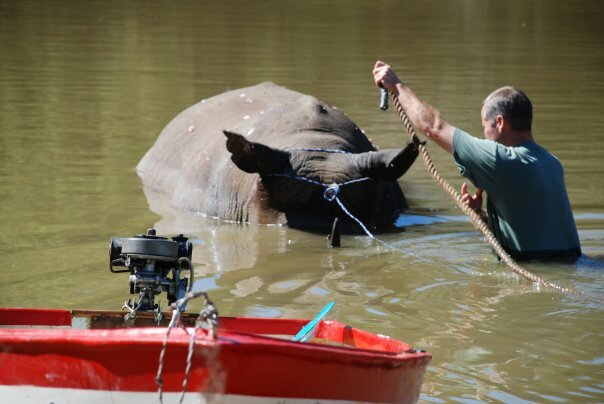 Life in a game reserve really does hang in the balance and with so many threats towards animals such as rhinos; it highlights how important conservation work towards maintaining population numbers of species really is.